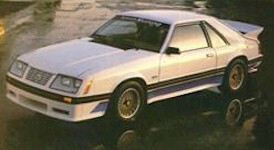 1984 New to 1984 was the Saleen Mustang where Steve Saleen took a stock Mustang GT and added his own suspension, brake, and body modifications. The engines remained stock. In 1984 he only modified three Mustangs - all hatchback GTs. They wore big 215/60 tires on 15x7 inch rims. They had custom front air dams, covered headlights, side skirts, and big decklid spoilers. The first ones only cost an additional $4,526 to the sticker price of the stock Mustang GT. Factory created Saleens (for all years) are serialized. They have their unique Saleen serial number on the driver's side front bumper, on a dash plaque on the center console, and on an under-hood plate riveted to the fender or firewall. See our 1984 Saleen Data Explorer for more information. 1985 The 1985 Saleen Mustang started with the 1985, 210hp, manual, Mustang GT and added aerodynamic body skirts, sport wheels, leather wrapped short throw shifter, 170mph speedometer, Racecraft suspension, and Saleen graphics. Modifications over the 1984 version included, bigger 225/60 tires, metallic brake pads, and a smoother decklid spoiler. See our 1985 Saleen Data Explorer for more information. 1986 The 1986 Saleen Mustang received a few new items: 16-inch wheels, newly styled front air dam and decklid spoiler, Hurst shifter, new three spoke steering wheel, GT bucket seats, Koni adjustable rear shocks, Kenwood stereo, and a left foot dead pedal. 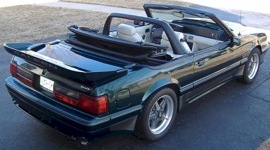 Mostly Mustang LX hatchbacks were converted, but eleven LX convertibles also received the Saleen conversion. 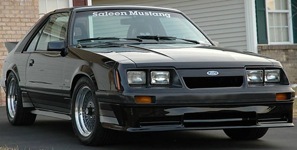 See our 1986 Saleen Data Explorer for more information. 1987 The 1987 Saleen Mustang was converted from the newly redesigned Ford Mustang base level LX hatchbacks and convertible. The new Saleen exterior features were the rear decklid spoiler and front valance. Performance changes included four wheel disc brakes, five lug SVO rotors, heavy duty master cylinder, 8-inch wide rear tires, and an optional 3.55 rear for quick acceleration. See our 1987 Saleen Data Explorer for more information. 1988 The 1988 Saleen Mustang Saleen Mustang saw minor changes from 1987; Monroe shock absorbers, Pioneer sound system, and a Saleen 170 speedo/tach. The radar detector was no longer standard equipment. 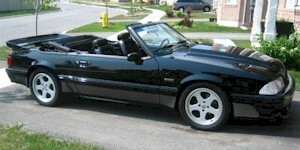 All Saleens were converted from hatchback LX, coupe LX, or convertible LX Mustang models. They all had factory 5.0L V8 engines, five-speed manual transmission, 3.08 or 3.55 rear, and 225/60VR-15 tires. 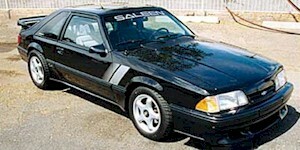 See our 1988 Saleen Data Explorer for more information. 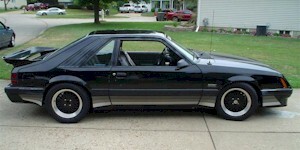 1989 The 1989 Saleen Mustang received a new new rocker panel striping design and a new SSC hatchback model. Standard equipment included a top-shelf Pioneer KEH 6050 AM/FM cassette & BP 850 graphic equalizer audio system, 225/50VR-16 General XP-200V tires, Monroe stocks, Saleen style aerodynamic body kit, 170mph speedometer, Hurst shifter, articulated FloFit sport seats, and a special Momo steering wheel. For the new SSC, a tweaked version of the E-code 5.0L was installed. It put out 292hp with a 65mm throttle body, new intake plenum, larger cylinder head ports, wider rocker arm ratios, HD cooling system stainless tubular headers, and Walker Dynomax mufflers. All the SSCs were painted white with gray/white interiors. See our 1989 Saleen Data Explorer for more information. 1990 The 1990 Saleen Mustang continued to be produced from Mustang LX coupes, hatchbacks, and convertibles. You could also get the higher performing SC (formally called SCC) hatchback as well. Suspension saw some upgrades over the previous year including; Racecraft suspension system and Monroe Formula GP shocks. The 3.55 rear continued to be an option but the customer could special request an automatic transmission or sunroof. 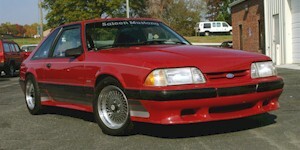 See our 1990 Saleen Data Explorer for more information. 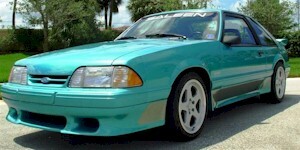 1990 Only 12, 1990 Deep Emerald Green 7-Up Mustangs were converted to Saleens. These Saleen 7up Anniversary Mustangs actually started life at the ford factory as coupes even though their model code is still P44 for Mustang LX convertible. 1991 The 1991 Saleen Mustang received a Racecraft suspension system, Pioneer AM/FM cassette stereo with 6 speakers, American Racing 16 inch rims with 225/50ZR-16 XP-2000Z tires, Saleen aerodynamic body kit, 170 mph speedometer, leather-covered shift knob, Hurst quick-ratio shifter, sport seats, and a Saleen Mustang drivers jacket. The Racecraft suspension included variable rate coil springs, Monroe Formula GP gas shocks, custom strut bearings, and urethane sway bar. See our 1991 Saleen Data Explorer for more information. 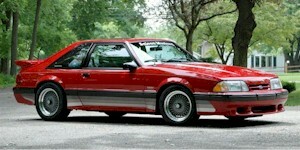 1992 There were only 17, 1992 Saleen Mustangs built. New for 1992 were Recaro racing seats and 17-inch wheels. Standard equipment in the Saleen conversions continued to be brake, shocks, springs, special strut bearings, urethane sway bar pivot bushings, 170mph speedometer, Hurst shifter, and a body kit. Out was the SC performance model, but you could get a Vortech supercharger installed. All conversions took place at their Long Beach, California facility. 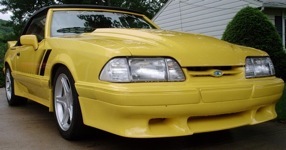 See our 1992 Saleen Data Explorer for more information. 1993 In 1993, Saleen Autosport continued to modify Mustang LX models directly from the Ford Dearborn plant as instructed by Ford Dealers. The number of conversions were up over 1992. There were a couple of special models too. The SC returned with the higher output normally aspirated 5.0L engine. A few Vortech supercharged SA-10 models were created to commemorate Saleen's 10th year of Mustang conversions. Each SA-10 was painted black with yellow accents. See our 1993 Saleen Data Explorer for more information. 1994 Along with the new Mustang body design came a new line-up of 1994 Saleen Mustangs. They were converted from both V6 and GT convertibles and coupes. New to 1994 were some V6-Sport models with sported Superchargers. 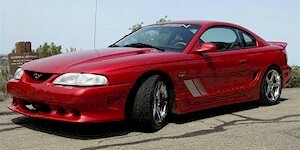 Also new in 1994 was the S-351 model which used a custom Saleen 351ci V8. And finally there were a few 480hp Supercharged SR models for racing. See our 1994 Saleen Data Explorer for more information. 1995 The 1995 Saleen Mustang offered two models: the S-351 and the supercharged SR. The S-351 models had their V6 and V8 engines removed and a large Saleen 351ci V8 put in its place. The 480hp Supercharged SR models were again produced for racing. Suspension modes included: progressive-rate front and rear coil springs; Racecraft shocks, and struts urethane swaybar bushings; strut tower braces, four-wheel disc five-lug brakes; and massive 18 inch wheels. Options included upgraded sound system, twin gauge pod, sports bar and tonneau for the convertible, Recaro racing seats, and 3.55 rear axle. See our 1995 Saleen Data Explorer for more information. 1996 The 1996 Saleen Mustang came in four flavors. The S-281 SOHC built from the 4.6L Mustang GT provided most of the conversions. A higher output S-281 DOHC built from the 5.8L Mustang Cobra was available. An S-351 version with a large 5.8L V8. And finally a couple of 500hp supercharged 5.8L Saleen SR models were built for racing. See our 1996 Saleen Data Explorer for more information. 1997 The 1997 Saleen Mustang continued to come in four flavors. The S-281 SOHC built from the 4.6L Mustang GT, a higher output S-281 DOHC built from the 5.8L Mustang Cobra, a S-351 version with a 5.8L V8, and a few 500hp supercharged 5.8L Saleen SR models. The S-351 model could be ordered with optional wider body panels, a carbon fiber hood, and a double rear decklid spoiler. See our 1997 Saleen Data Explorer for more information. 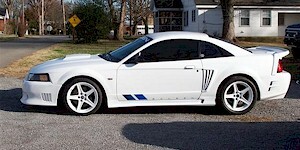 1998 The 1998 Saleen Mustang received new rocker panel striping design and a new SSC hatchback model. Standard equipment included a top-shelf Pioneer KEH 6050 AM/FM cassette & BP 850 graphic equalizer audio system, 225/50VR-16 General XP-200V tires, Monroe stocks, Saleen style aerodynamic body kit, 170mph speedometer, Hurst shifter, articulated FloFit sport seats, special Momo steering wheel, and even a Saleen Mustang jacket to wear. See our 1998 Saleen Data Explorer for more information. 1999 Saleen Mustang came in three different models which came in either coupe or convertible body styles. The base level S-281 came with an optional supercharger for even more bang. 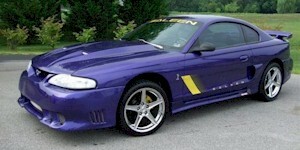 A couple of racing Saleens were also created. This was the last year for the big engined S-351 model. 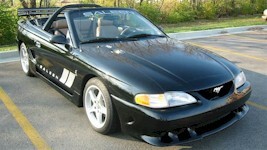 See our 1999 Saleen Data Explorer for more information. 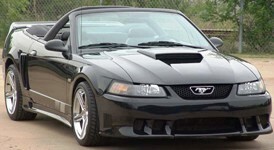 2000 The 2000 Saleen Mustang came in two models: the 285hp S-281 and the 350hp supercharged S-281 S/C. Standard equipment were Racecraft springs, Bilstein N2 shocks and struts, urethane swaybar bushings, strut tower brace, 18x9 inch wheels up front, and 18x10 inch in the rear. Options included Alcon 13-inch brake rotors, twin gauge pod, sports bar and speedster package for the convertible, Recaro racing seats, 3.55 rear, and a carbon fiber hood. 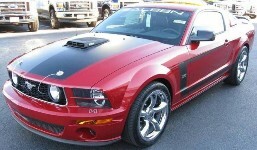 See our 2000 Saleen Data Explorer for more information. 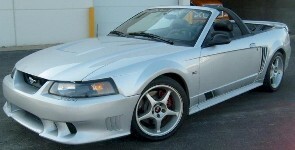 2001 The Cobra conversion was added back to the Saleen line-up for 2001. The Cobra conversion offered the DOHC and a few styling upgrades from the standard Saleen. The S-281 S/C model carried a new Roots-type blower for its supercharger. This added another 15 horsepower over the the 2000 version. The Standard S-281 Saleen coupe started at $32,099, while the Cobra version started at $41,600. A race version (SR) model was offered for a mere $158,000. See our 2001 Saleen Data Explorer for more information. 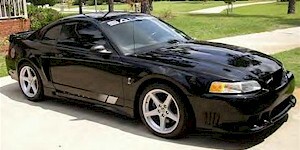 2002 The 2002 Saleen continued to come in three flavors even though the Cobra model conversion was not available. A new "S-281 E" was released. The "E" stood for Extreme. The "E" model engine put out 425hp thanks to a Series V twin-screw supercharger, aluminum heads and pistons, and 2.5 inch exhausts. See our 2002 Saleen Data Explorer for more information. 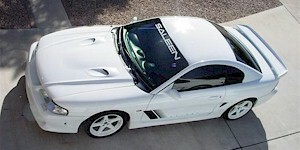 2003 There were five Saleen models available in 2003. You could get the base level S-281, the supercharged S-281 S/C, the engine tweaked S-281 E, the S-281 supercharged Cobra conversion, and the anniversary SA-20 convertible. The S-281 S/C horsepower was increased 10 hp thanks to the addition of a new Lysholm screw-type supercharger. The S-281 E's horse power was increased another 20 hp by switching to a larger throttle body and a smaller supercharger pulley. The anniversary SA-20 models where all white convertibles. 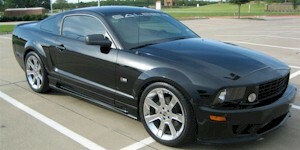 See our 2003 Saleen Data Explorer for more information. 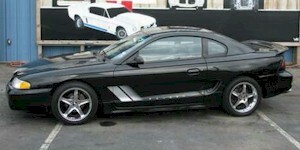 2004 The 2004 Saleen conversions came in four flavors and two body styles. You could get the base S-281 Saleen with the 290hp SOHC engine, the S-281 S/C supercharged version on the GT, a supercharged cobra conversion, and the ultimate S-281 E Extreme with the 425hp engine. The came in all the same colors as the Mustang and sported the Saleen Body kits, suspension upgrades, interior accents, and engine modifications. 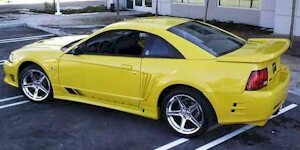 See our 2004 Saleen Data Explorer for more information. 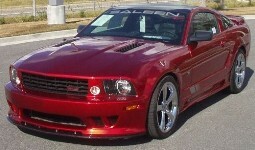 2005 The 2005 Saleen conversions were done on the new body style Mustang GTs. You could get the base S-281 model, the S-281 S/C supercharged version, and the S-281 E "Extreme" model. The first two could be ordered in the coupe or convertible body styles. The Extreme model only came in the coupe. They came standard with the Saleen Quick Ratio 5-speed manual transmission. A 5-speed automatic was optional. Suspension included MacPerson strut, 1.38 inch front and 0.79 inch rear stabilizer bars, urethane pivot bushings, and a live rear axle. 2006 The 2006 Saleen comes in two body styles and three flavors. You can get the coupe and convertible in an S-281, S-281SC Supercharged, and the S-281E Extreme. New for 2006 is the optional Scenic Roof option which gives you an entire roof of glass. 2007 The 2007 Mustang Saleen comes with four engine options: S281 (4.6L 335hp V8), S281SC (4.6L 465hp Supercharged V8), S281E (4.6L 550hp V8), and the Parnelli Jones (5.0L 400hp Supercharged V8). See the Saleen Data Explorer for more information. 2008 The 2008 Mustang Saleen comes with five engine options: S281 (4.6L 335hp V8), S281-SC (4.6L 465hp Supercharged V8), H302 (4.9L 400hp V8), H302-SC (4.9L 580hp Supercharged V8), and a S302-E (4.9L 620hp extreme supercharged V8). It also comes with standard trim, American flag trim (AF), or red flag trim (RF). See the Saleen Data Explorer for more information. 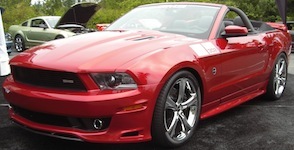 2009 The 2009 Saleen Mustang line-up contains many models. One new addition is the 2009 Dark Horse Extreme Edition Mustang which has the new Speedlab SuperShaker option, 620hp, and all black with black accents. Other models include the 585hp Supercharged S302 and the 420hp Racecraft Supercharged 420S. Versions of the H302, S281, and S302E line are also offered. 2010 Two 2010 Saleen Mustangs are available: one built by Saleen Performance Vehicles (sold by Steve Saleen in 2009) and the other SMS (Steve Mark Saleen) Supercars. 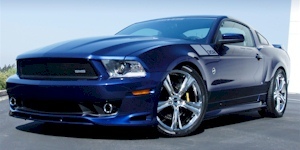 The 2010 SMS 460 Mustang which has the new SMS 296 supercharger on a 4.6L V8 engine giving 470hp and 427 ft-lbs of torque. The SMS 460X model has the same supercharger on a specially built 5.0L V8 resulting in 655hp and 600ft-lbs of torque. Also new to 2010 is the SMS Red Butterfly Air Induction Hood, Front and side splitters, rear fascia and diffuser with rear wing, Watt's linkage suspension, SMS brakes, SMS performance striped seats, and leather hand-stitched dash and interior panels. 2011 The 2011 SMS Saleen by Steve Mark Saleen (SMS) Supercars comes in to models: a 400hp 302 4-valve V8 and a 440hp+ 302 supercharged V8. Both models come with the aerodynamic SMS body kit, custom, interior, special handling, and standard or wild exterior colors. 2012 The 2012 Saleen brand returns to Steve Saleen of now SMS Supercars. 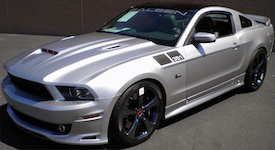 The 2012 Saleen has the SMS 302 model which is powered by a SMS 296 Supercharged 302ci 4-valve V8 engine. It has a SMS performance suspension, exhaust, special 20-inch wheels, and brake upgrade. The body kit includes front bumper, front splitter, rear bumper, rear diffuser, side skirts, side splitters, and a special hood and spoiler. Inside there is two-tone leather performance seats, door inserts, leather shift knob, 200mph gauges, special identification, and a Steve Saleen personally signed dash! Saleen is also offering the SMS 25A model based on the 2008 25A Concept which has a 730HP engine with a red butterfly supercharger intake poking through the hood! 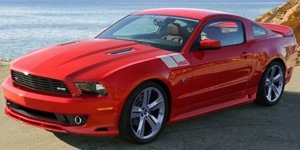 2013 The 2013 Saleen Mustang was a low production number year as the product name went back to Steve Saleen. A total of 20 cars were produced, mostly the S302 model coming in the form of a 4V Black Label, supercharged S/C Black Label, 4V White Label, and S/C Yellow Label. Three 351 X Black Labels were also built. 2014 The 2014 Mustang Saleen can be applied to either the coupe or convertible body styles. There are three models; White Label, Yellow Label, and Black Label. The base level White Label has the 440hp 302ci 5.0L V8 engine, 6-Speed manual or 6-Speed automatic, and the Saleen 302 Styling Package. The Yellow Label has the 625hp 302ci Supercharged 5.0L V8 engine (SSC). The Black Label has the upgraded Saleen 302 Signature Series body kit and choice of four engines; the 440hp 302ci, the 625hp 302 Supercharged (SSC), a 351 engine, and a 700hp Supercharged 351 (Extreme). 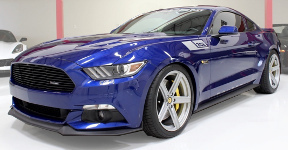 2015 The 2015, Saleen Mustang is available in three upgrade levels a 450hp 302 White Label, 715hp 302 Yellow Label, and a 730hp 302 Black Label. The Black Label includes a completely redesigned front end with a longer hood, narrower grille, and cool lower splitters. 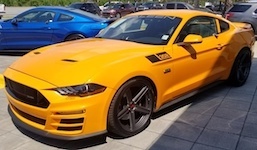 2016 The 2016 Saleen Mustang continues the performance tradition of the S302 normally aspirated White Label with Saleen 302 Styling Package, supercharged Yellow Label with Saleen 302 Styling Package, and the ultimate supercharged Black Label model with Saleen 302 Signature Series aerodynamics. Other Saleen features include Saleen suspension, Saleen wheels and brakes, Saleen interior, and Saleen badging and graphics. 2017 The 2017 Saleen Mustang comes in three levels: the 400hp normally aspirated White Label, the 715hp supercharged Yellow Label and Black Label. Both the White and Yellow label comes with the Saleen 302 Styling Package, while the Black Label comes with the Saleen 302 Signature Series aerodynamics. Other features include Saleen suspension, Saleen wheels and breaks, Saleen interior, and badging. New for 2017 is the Saleen Championship Commemorative Edition. 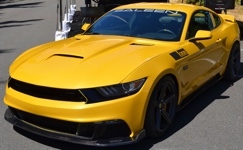 30 of these, 30 year anniversary of the SCCA championship wins, with a yellow, black, and white Saleen R.
2018 The 2018 Saleen Mustang continues the performance tradition of the S302 normally aspirated White Label, supercharged Yellow Label, and the ultimate supercharged Black Label model. The White Label has a performance improvement to 475 horsepower, while the Yellow and Black label adds a supercharger with 740 horsepower. The Black Label also adds custom front and rear fascias as well as a variety of special Saleen exterior colors. 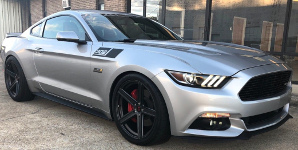 2019 The 2019 Saleen Mustang continues the Saleen performance tradition of the S302 normally aspirated White Label, supercharged Yellow Label, and the ultimate supercharged Black Label model. New to 2019 is the 780hp, 35th commemorative edition, SA-35 with a limited quantity of 10.